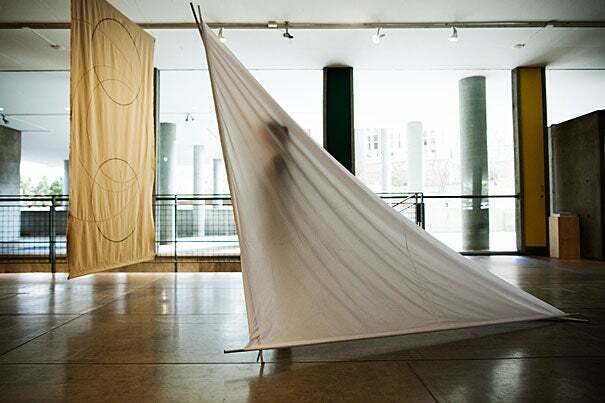 A new exhibition at the Carpenter Center for the Visual Arts aims to stem the loss of those important works. “Embodied Absence: Chilean Art of the 1970s Now” presents several performance-based works from that politically charged time in partnership with a younger cohort of Chilean artists. Human rights abuses marked Pinochet’s near 20 years in power, with more than 3,500 deaths and disappearances. Some estimates put the number of exiled Chileans at 200,000. Among the works on display in “Embodied Absence,” which runs through Jan. 8, is a video by Cecilia Vicuña, who resided in England and Colombia in the years immediately following the coup. Her 16 mm colorful film “Sol y Dar y Dad,” part of a series inspired by the act of writing as power, shares exhibit space with “A Mile of Crosses on the Pavement” from Lotty Rosenfeld, a founding member of the activist art collective CADA (Colectivo Acciones de Arte). Rosenfeld created the series by staging road divides with crossed panels of white fabric. 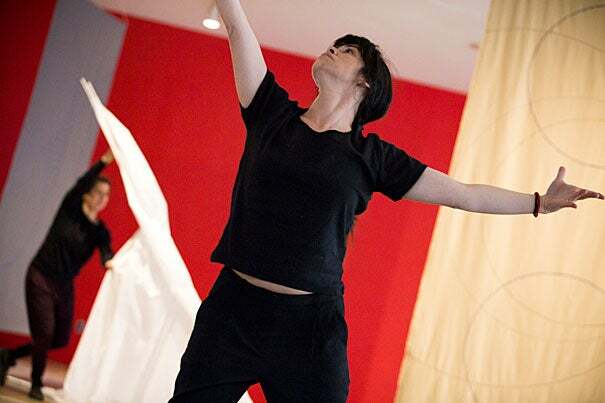 With support from the Harvard University Committee on the Arts, “Embodied Absence” features works by 15 artists, including a reimagining of an earlier work by Carmen Beuchat, this called “Two not One II, 2016.” The dancer, choreographer, and founder of her own postmodern dance company in Chile moved to the United States in 1968 intending to study with Merce Cunningham. In 1975, she first staged her experimental “Two not One” in New York, playing with sculptural objects and choreographed movements in lines and circular shapes. Dancing abroad in Italy with Trisha Brown’s company in 1973, Beuchat recalled: “When the coup happened, my life did change. It was my country. It was like my mother and father were killed.” Her family encouraged her not to return to Chile following the coup. “Two not One, 1975” and “Two not One II, 2016” are built around the concept of the mobile sculpture. Beuchat took inspiration from the Indian god Shiva, a half-man, half-woman deity, and added ideas of shadow and light. “It’s two personas in one piece, and I created this dynamic with dancers using white and black fabrics,” she said. To stage the “Embodied Absence” version of the work, Beuchat and her team used three photographs that she had from the original performance to help recreate the steps. More recently, her dance theorist, Jennifer McColl, discovered 30 photographic slides that provided even more details about the architectonic movements of the dancers — images that are today projected on the gallery wall of the Carpenter Center. Chilean dancers Carolina Escobillana and Paula Sacur performed the piece twice last week surrounded by bright fabric panels created by artists Felipe Mujica and Johanna Unzueta, who were born in Chile in 1974. A photo from the exhibit "To Serve Better Thy Country," depicting ROTC cadets gathering for a photo in front of Crufts Laboratory, April 1944.